Gurney Journey: "They will never shoot you for what you leave out of a picture." "They will never shoot you for what you leave out of a picture." 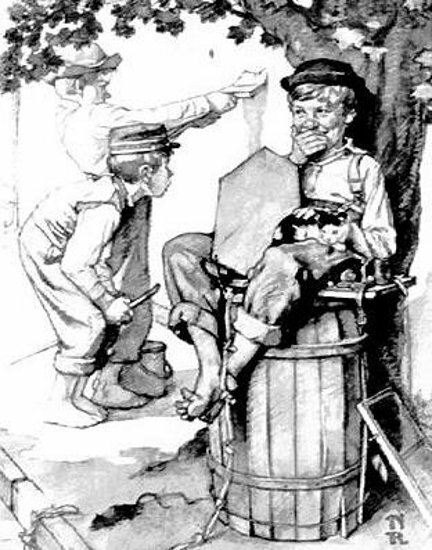 When Norman Rockwell took on the challenge of illustrating Mark Twain's Tom Sawyer, he went to great lengths for authenticity, traveling to Twain's hometown of Hannibal, Missouri, to research characters, costumes and props. Here is his initial charcoal drawing for the scene of whitewashing the fence. 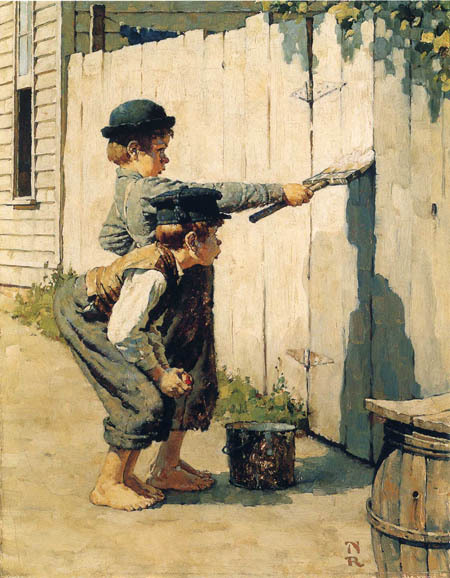 Tom Sawyer has escaped his chore by convincing his friends that it's a special privilege to paint a fence. Twain lists the loot that they paid Tom, including: a kite, a dead rat, a cat with one eye, and a window sash. Tom sits on a barrel, chuckling into his hand at his pals, who work hard at the job he was supposed to do. At some point Rockwell must have felt that his original conception was too literal, too much "on the nose." His finished composition removes Tom Sawyer entirely. Rockwell once said that "every single object shown in a picture should have its place there because it contributes to the central theme of the picture. Otherwise it simply does not belong and should be discarded ruthlessly." Or as his hero Howard Pyle once said, "They will never shoot you for what you leave out of a picture." This is great advice! And this is one of my favorite scenes in all literature. When it comes to great things that have come from the United States, you can't do much better than Rockwell and Sawyer. Interesting- I notice in final painting that the rapt attention the boys pay to the paint is the humorous heart of the story. And we're seeing it through Tom Sawyer's eyes, instead of at his eyes as in the sketch. My art teachers went over this very same point many times, using almost the same example. Howard Pyle and NC Wyeth also had some great lessons about not being overly literal with your illustrations. It really stuck with me. Now I cringe whenever I see illustrations that stuff too much in just for the sake of having it. In an Andrew Wyeth book he said his dad wanted to bring to life a part of the book that hadn't been fully described. I can't remember the exact quote unfortunately. But it was to the effect that the author has painted the picture in the imagination already, so the illustrator should pull out just the suggestions of detail. He was referencing "Blind Pew" from treasure island. Wow, that's brilliant. As a beginning illustrator, I have struggled with making the picture fit the text exactly. I know it ought to say something that the text doesn't say--that it's not just a picture of the words--but this is a beautiful note. And the example that you show makes it perfectly clear. If I had only seen the first drawing, I would have thought it was lovely. But the second one--as Mark said--shows us the scene through Tom's eyes, not showing us Tom. Perfection is achieved not when there is nothing left to add, but when there is nothing left to take away." Rockwell's choice is a great example of the truth represented by the excellent quotes that Dan posts. Or, to boil it down even further, the famous - Less is more. It's not without exception, but it's so often THE rule to employ. ...or course it's not just a matter of simply leaving things out, but the question of WHAT to eliminate. Rockwell's decision here was masterful. Discard "ruthlessly": Sounds so simple. Think I need to print it up and post it, maybe in more than one place and for more than just the art in my life! I don't have Pyle's own words, but in an item about his Art Students' League lectures, The American Art News for March 25, 1905, said, "He teaches the necessity of elimination - that is, after a composition is once created the eliminations are more important than the additions..."
I think it was Willa Cather who said to "Kill your babies." Whoever said it, it's another interesting thought about the creative process because it addresses the bond we form with something we've created, and the emotional difficulty of removing it. I find I have to get overcome a certain resistance to take something out of a picture, especially if I worked hard on it. enjoyed this post...Rockwell was a genius! I'm pondering the differences between Illustration and Fine Art. For a narrative piece the advice seems sound. However,before I read your peice I'd seen this image and never known which of the two boys shown was Tom. You know, Runninghead makes an excellent point about this particular illustration. My earlier reaction to the final version was exactly the same...i.e. not being sure if one of the boys is Tom himself. That doesn't of course diminish my appreciation of the value of good editing. Of course the real dilemma is after you've struggled and struggled with taking things out -- the client says -- can you put it back in?